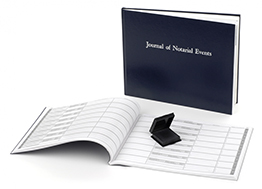 Introducing the newest and most innovative notary journal available today. The layout is logical and easy to follow. This notary journal employs Cleanprint technology, a unique method of capturing thumbprints. Cleanprint is exclusive to this notary journal and is not available in other journal products. This new clear inkless pad produces permanent, black thumbprints in your journal, but unlike other inkless pads that leave a gray or black residue to be wiped off, this pad leaves absolutely no visible residue on your clients' skin. The inkless pad is easy to open, even with one hand, will stay shut when not in use and will not dry out over time. The pad size (2 inch square) makes it easy to capture anyone's thumbprint.